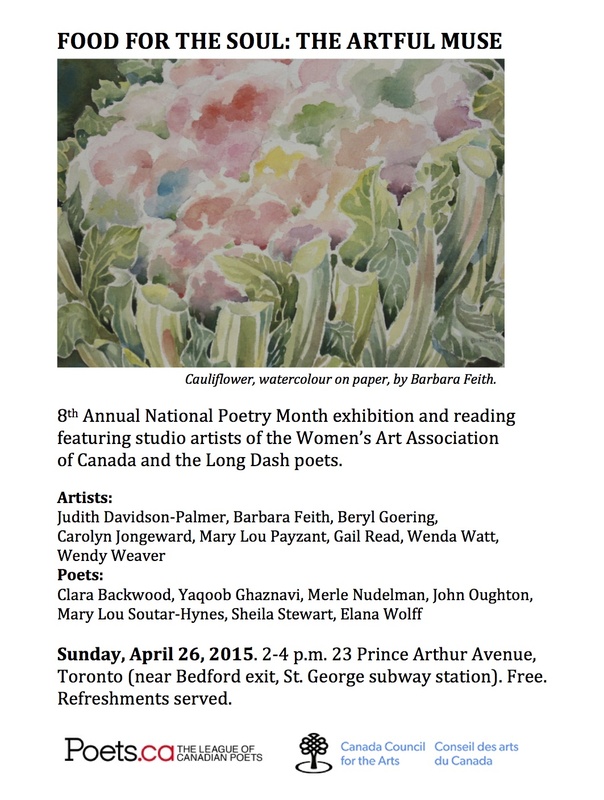 This Sunday, April 26th the eighth National Poetry Month exhibition and reading, a large-scale annual collaboration between writers and visual artists, will be taking place in Toronto. The joint event brings together visual art by members of the Women’s Art Association of Canada and associated poems by the Long Dash Group. The poets and artists come together to share their work, find resonances between art forms, and become friends in the process. The age range of the participants of the project is from around 40 to mid- 80s. The participating Long Dash Group poets will include Guernica poets Clara Blackwood, Merle Nudelman & Elana Wolff, as well as Yaqoob Gjaznavi, John Oughton, Mary Lou Soutar-Hynes and Sheila Stewart. The event will take place on Sunday, April 26th from 2-4 PM at 23 Prince Arthur Avenue in Toronto near St. George Subway Station. The admission to the event is free. Refreshments will be served. Tagged with Clara Blackwood, Elana Wolff, Long Dash Group, Merle Mudelman, National Poetry Month, Poetry, Visual Art.